A brilliant all-round, all-valve mini head with oodles of character… but no reverb. Minuscule dimensions; wide range of tones; superb direct out; sounds great with a big cab. Valves hard to get to; no reverb. The TubeMeister's EQ is powerful, offering a range of useable guitar tones from metal to blues. Is the pocket-sized TM5 the cutest amp head ever? A 12AX7 in the pre- and a 12BH7 in the power stage glow in Blue Oyster Bar-style. 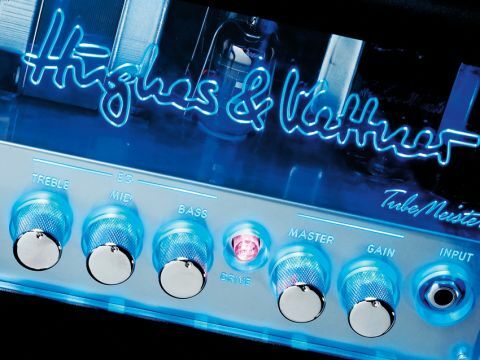 Last year, we had the world's first official review of Hughes & Kettner's groundbreaking TubeMeister 18 head. We concluded that it is small, good value and loud enough to take on small gigs, despite its tiny dimensions. Even better, it has the not inconsiderable benefit of an excellent sounding speaker-simulated direct output: we rated it, and continue to rate it, very highly. "The TM5's EQ is very powerful, enabling you to go from bouncy, mid-scooped country-type cleans right through to a smokier, more mid-rich jazzy deal." To kick off 2012, we have the even smaller, even cuter five-watt version in head and combo formats. Are they credible downsizing in real-world valve amps, or one sandwich short of a lunchbox? The first thing to say about the TubeMeister 5 head is that it's tiny - almost laughably so. In fact most of our staffers assumed it was an elaborate desk toy sent as a Christmas gift! Secondly, and more usefully, the combo and head are exactly the same in terms of electronics. Unlike the two-channel, three-mode 18-watt head (which strangely now adopts 'big' brother status), the 5 gets a single-channel, dual-mode set-up. Even so, H&K has packed five knobs and one switch onto the tiny control panels for independent gain and volume adjustments and a powerful, albeit passive, three-band EQ section. The push switch kicks in the distortion. Power them up and it all glows blue in glorious H&K tradition. The standard of external finishing high on all the metalwork of the head enclosure. Accented with quality, extremely positive-feeling metal control knobs, metal jacks and a reassuringly clunky switch, the tiny TMs uphold H&K's well-deserved reputation for high standards. Behind the blue you'll find a single 12AX7 valve in the preamp section, and one 12BH7 - the same as that used in Blackstar's successful HT-5 - in the power section. The 12BH7 is a dual triode that runs within itself in push-pull (like two separate matched valves would in a bigger amp) to chuck out a whole five watts. Like the 18-watt version, the TM5 includes a power-soak, though here it's in simpler form. Instead of providing a selection of incremental power reductions down to silent, it's simply the full five watts or silent: on or off. The latter is particularly useful if you want to record silently via the inbuilt XLR direct output - with the power soak in the off position, you don't even need a speaker connected, meaning it can sit pretty much anywhere you like as long as there's power. There's no effects loop, no reverb and no footswitch, however. The direct output is a custom, inbuilt version of Hughes & Kettner's well respected Red Box DI - we rate it very highly in the 18-watt incarnation (and indeed as a standalone box), so it'll be very interesting to hear how it compares on the end of the TubeMeister 5's smaller output section. A quick look inside reveals a custom-designed PCB, screwed securely to the metal chassis. As well as the circuit components, it houses the pots and valve bases, but not the transformers and mains switch, as you'd expect. The Red Box DI circuit is completely separate on its own PCB, which includes the power soak switch and the speaker output that will take anything between an 8- and 16-ohm load. As we've come to expect from H&K, all is remarkably efficient and superbly designed; 'designed and engineered in Germany' is printed on the rear panel, but nowhere other than the packing box does it say 'manufactured in PRC'. Are we still embarrassed about Chinese build? In terms of quality, we shouldn't be, especially when it's as well-commissioned as this. We loved the sound of the head set up with a 1 x 12 cab. Just for kicks, we also tried the tiny device atop a H&K Celestion Greenback-loaded 2 x 12 and an Orange Celestion V30-loaded 4 x 12 too, with predictably bigger tonal results. The TubeMeister 5's clean channel has a great sense of sparkle and presence that typifies many H&K valve amps. It will overdrive if you max the gain control and use more powerful pickups, but there's a surprising amount of headroom and volume on offer for such a modest power rating. Forget it with a loud live drummer, but for duos and accompanying vocalists, you could use this for little gigs with no problems. The EQ is very powerful, enabling you to go from bouncy, mid-scooped country-type cleans right through to a smokier, more mid-rich jazzy deal. A lot of tiny amps don't have the full bass/middle/treble offering, so there's a great deal more flexibility here than on a Marshall Class 5 or Vox AC4, for example. We do miss reverb, though. Engaging the overdrive mode ushers in a big kick in gain, starting at a slightly pushed, vintage-type amp overdrive, right through to modern, heavy, saturated distortion. There really is a great deal of variation in drive off the gain pot, which you can balance with the master/output section to sound relatively smoother or more fuzzy. As we said, the EQ is very powerful so you span from scoopy '80s-type metal tones, all the way through to punching, mid-gained '60s-style blues. Again, the 1 x 12 option sounds smoother and more grown up than the 1 x 8. The inbuilt Red Box DI does a superb job of clean tones especially. We'd say it gets less convincing with more gainy sounds when compared directly with a mic'd signal, but much of that is easily tweaked with EQ in your recording software. Certainly, for convenient silent recording, it's superb. Mixed with the mic'd signal, it sounds huge. During our recording, we did find the head more susceptible to extraneous noise than the Bogner Goldfinger 45 we were demoing in exactly the same conditions. A DI box between amp and guitar sorted the issue, however. On cuteness factor alone, the TubeMeister 5 has that 'must-have' quality, especially at this attractive price. Add a suitable reverb or echo pedal and you have a brilliant little amp for home practice and recording duties. It's capable of a huge range of tones, and the inbuilt Red Box is genuinely useful, not just a spec point that gets listed but never really used. It doesn't feel as tonally refined as the bigger, more expensive TubeMeister 18 - but then it's unrealistic to expect it to, of course. Many people will be wondering whether this is a better choice than a comparably priced digital modelling amp, and that's a very tough call. A valve amp of this nature sounds more visceral, has a different response to the overdrive and all-important mid-range frequencies, and so feels quite different under your fingers. Some people like that, some people don't - do yourself a favour, though, and be sure to A/B test the TubeMeister 5 alongside a 20-40-watt modelling amp. We think you'll be very surprised.